Great photo here of iconic winemaker and wine pioneer, Paul Hobbs. Friends, we do a brief jaunt down to Argentina today. While it is hotter than Hades down there, we continue to bask in the winter doldrums drenched in rain and sun deprivation. Great Malbec seems like the perfect remedy for this time of year. One of the outstanding producers of Argentinian Malbec, Viňa Cobos is the brainchild of famed winemaker and producer, Paul Hobbs. It is hard to believe that this great estate was started twenty years ago. Paul saw great potential for creating world-class Malbec and sought to develop vineyard sites in the Luján de Cuyo and Valle de Uco of Mendoza. He was met with great critical acclaim since his first vintage in 1999. Paul found some special, high elevation sites in both growing regions from 800 m (2,624 ft) and 1,100 m (3,308 ft) above sea level in the Luján de Cuyo to 900 m (2,952 ft) to 1,400 m (4,593 ft) above sea level in the Valle de Uco. 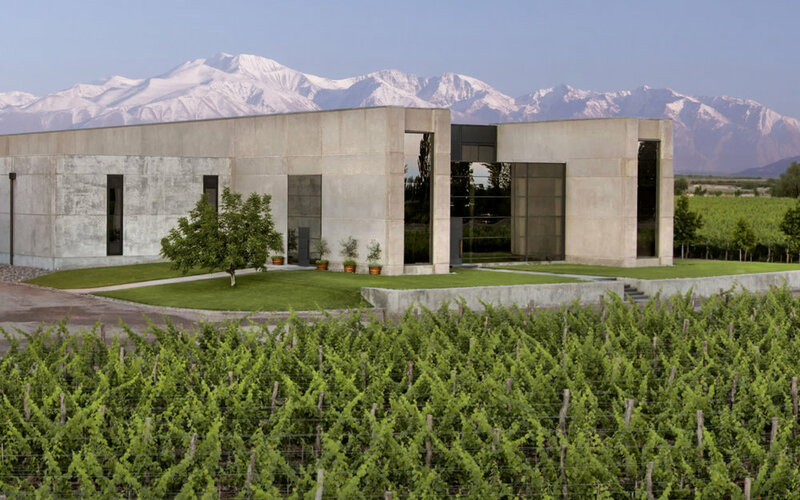 The Viňa Cobos winery is a state of the art facility in Mendoza. The top wine that I sampled was sourced from the Marchiori Estate, set at over 3,000 feet. The estate is planted to a host of varietals including Malbec, Cabernet Sauvignon, Chardonnay, Petit Verdot and Merlot. Malbec vines at this estate are more than 80 years of age. I was absolutely blown away with the 2015 Viňa Cobos ‘Cobos Marchiori Estate’ Malbec (WWB, 98) which is the best Malbec from Argentina that I have ever sampled. This wine had such incredible fruit weight and concentration while maintaining marvelous poise and acidity. Quite simply, this wine has everything you want in a stellar Argentinian Malbec. While I have never visited this storied estate I can’t wait to visit and see this dramatic mountainous setting. I am sure the photos do not do justice to its beauty.